The other day, I watched a documentary about Frank Sinatra that included a lot of information that I did not already know. Obviously, Sinatra was one of our great entertainment icons, but it was interesting to get a more intimate look at his life. The documentary led me to this post and a look into the wisdom that can be found in some of his movies. Remember the rules. I must have seen the movie, and the quote can come from any character in that movie. Now, let see what can be found in the dialogue of the Chairman of the Board. Nobody ever lies about being lonely. A man should be what he can do. A man loves a thing that don’t mean it’s gotta love him back. Fifty percent of something is better than one hundred percent of nothin’. It’s a terrible thing to hate your mother. Have you ever noticed that the human race is divided into two distinct and irreconcilable groups: those that walk into rooms and automatically turn television sets on, and those that walk into rooms and automatically turn them off? People change. They don’t always turn out the way you expect. The leader of the Rat Pack. Frankie seemed almost to be shielded from scrutiny during his career. Was that because he was a pal of Presidents? He’s good for lots of quotes – on and off the screen. I didn’t realize that he was accused of being a communist until I watched the documentary. The evidence was he campaigned for FDR. 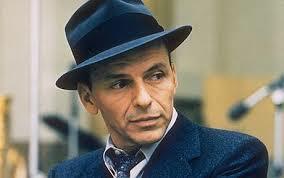 if you haven’t ever listened to it, give “Frank Sinatra sings for Only the Lonely” a go. One of the great bar room blues albums. The track, “One For My Baby”… and one more for the road… is magnificent. One For My Baby is an awesome song. That was an excellent documentary/mini series. We learned details about some stuff we knew, confirmed stuff we suspected, and a whole bunch of back story that was really fascinating. I wondered how many people saw it. I thought it was great. It was great. They run it frequently on HBO, so probably a lot of people have seen it and more will see it. I think Netflix has it too. What’s the name of this particular documentary? Sounds very watchable. I am not sure. It was a two-part documentary on HBO.